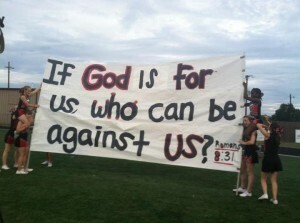 KOUNTZE, Texas — Cheerleaders in Texas have appealed a ruling finding a lawsuit against their local school district moot after it changed its policies surrounding the display of Bible banners during school sporting events. As previously reported, in Kountze, Texas, a tiny east-central Texas town with 2,000 residents, middle school and high school cheerleaders have used banners decorated with Bible verses for decades. Banners include messages such as “I can do all things through Christ who strengthens me,” from Philippians 4:13 and “If God be for us, who can be against us?” from Romans 8:31. In light of FFRF’s complaint, officials with the school district forced the cheerleaders to remove all Bible references from their banners. Soon afterward, the Liberty Institute—a Texas-based nonprofit organization dedicated to protecting religious freedom—filed a lawsuit against the school, claiming the cheerleaders’ rights to religious expression had been suppressed. This sparked a long, heated, seven-month legal battle, as the Kountze ISD (backed by the FFRF) argued that the cheerleaders were using school property to endorse Christianity, while the Liberty Institute defended the cause of the cheerleaders. In May of 2013, a Texas judge sided with Liberty Institute and the Kountze cheerleaders, ruling that the banners “have not created, and will not create, an establishment of religion in the Kountze community.” But as the school district appealed the decision, the case soon made its way to Texas’ Ninth District Court of Appeals. In May, while upholding the cheerleader’s right to display the banners, the court ruled that the case was now moot because the district had since altered its policy. But the Liberty Institute disagreed that the case should have been found moot. “For over two decades, everyone understood that the banners are the cheerleaders’ speech, not the government’s speech. So the cheerleaders should have the right to include religious messages if they want to,” added attorney James Ho of the law firm Gibson, Dunn and Crutcher, which has joined Liberty Institute in the fight.